The Federated States of Micronesia annually celebrate Independence Day on November 3. This is a public holiday, that is observed by all four states of Micronesia. 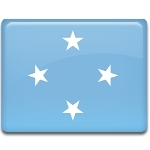 The Federated States of Micronesia was formerly a part of the Trust Territory of the United Nations, administered by the USA. This status Micronesia gained after the end of World War II, when the Japanese mandate of the League of the Nations was canceled. The USA administered Micronesia as a part of the Trust Territory of the Pacific Islands, including modern Republic of the Marshall Islands, Micronesia, Republic of Palau and Northern Mariana Islands. The four states of Chuuk, Kosrae, Yap and Pohnpei ratified a new constitution to become the Federated States of Micronesia on May 10, 1979. The new state signed a Compact of Free Association with the United States in 1982, that came into effect on November 3, 1986. Anniversary of this day is celebrated by people of the Federated States of Micronesia as Independence Day from the USA.